Mark Pulling sees no reason why Lancing cannot spring another FA Cup surprise on Saturday. 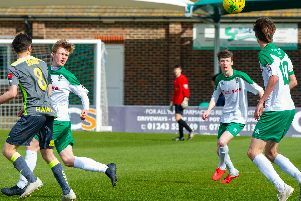 Lancers have already beaten division-higher Bostik League South East sides Haywards Heath Town and Greenwich Borough on their way to the first qualifying round. This current run is the furthest Lancing have gone in the oldest cup competition in English football for 12 years and they will be looking to progress further when they head to Heath and Greenwich’s league rivals Phoenix Sports. Phoenix have won three of their opening four league fixtures but first team coach Pulling feels Lancers will go there well prepared. He said: “We go there with nothing to fear and looking to continue our run in the FA Cup. Ash (Bailey; Lancing manager) has watched them and we’ve seen some video, we’re prepared for the test ahead. “This is going to be a great occasion for everyone behind the scenes at the club, who maybe go unnoticed and have been in and around the club for years. “As much as it’s going to be a good day, we are going out to win it. We’ve shown against Haywards Heath and Greenwich Borough in previous rounds what we are capable of and we’ll be looking to do the same in this tie. Lancing will be hoping they have better luck in a national competition than they did at Sheerwater in the FA Vase on Sunday. Ten-man Lancers let a goal lead slip as they suffered a 2-1 first round qualifying defeat to the tournament debutants. In-form frontman Charlie Pitcher notched his seventh goal in eight matches to give Lancers a sixth minute lead, but strikes either side of the break from Shane Cheeseman and Shane Rideout secured Sheerwater’s progress. Jack Webber was shown a straight red card for Lancers shortly after the hosts had taken the lead late on. Pulling said: “I think it’s probably the first time that we should say we are disappointed. “We’re at the point where a few of them need to look at themselves. We’re in to the season now, we know what teams are about and we’ve got to ask them the questions. “When you’re in the lead you need to make sure you’re doing enough to see those games through. LANCING: D’Cruz; Pulling, Bygraves, Knight, Willard; Rowe-Hurst, Williamson, Hendy, Saunders, Daniel; Pitcher. Subs: Webber (Hendy, 72), Gardener-Lowe (Pitcher, 77), Tighe (Willard, 85), Tredrea, Pittock. Lancers were dumped out of the Peter Bentley Cup at league rivals Horsham YMCA on Tuesday evening. Leon Dramis’ late penalty proved just a consolation as YM book a spot in round three with a 4-1 triumph.